NMR spectroscopy is the most valuable and versatile analytical tool in chemistry. While excellent monographs exist on high-resolution NMR in liquids and solids, this is the first book to address multidimensional solid-state NMR. Multidimensional techniques enable researchers to obtain detailed information about the structure, dynamics, orientation, and phase separation of solids, which provides the basis of a better understanding of materials properties on the molecular level.Dramatic progress-much of it pioneered by the authors-has been achieved in this area, especially in synthetic polymers. Solid-state NMR now favorably competes with well-established techniques, such as light, x-ray, or neutron scattering, electron microscopy, and dielectric and mechanical relaxation. The application of multidimensional solid-state NMR inevitably involves use of concepts from different fields of science. This book also provides the first comprehensive treatment of both the new experimental techniques and the theoretical concepts needed in more complex data analysis. The text addresses spectroscopists and polymer scientists by treating the subject on different levels; descriptive, technical, and mathematical approaches are used when appropriate. 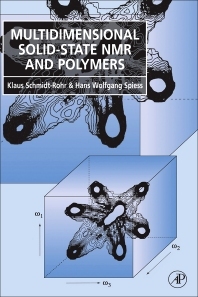 It presents an overview of new developments with numerous experimental examples and illustrations, which will appeal to readers interested in both the information content as well as the potential of solid-state NMR. The book also contains many previously unpublished details that will be appreciated by those who want to perform the experiments. The techniques described are applicable not only to the study of synthetic polymers but to numerous problems in solid-state physics, chemistry, materials science, and biophysics. Academic and industrial researchers in NMR spectroscopy polymer science, solid state chemistry, materials science, and biophysics. Will appeal to some graduate students. Introduction. Principles of NMR of Organic Solids. High-Resolution NMR Techniques for Solids. Fourier Theory for 1D and 2D NMR. Short Review of Structure and Dynamics of Solid Polymers. Multidimensional Separation and Correlation. Polymer Dynamics: Multidimensional Exchange Experiments. Multidimensional Exchange NMR Above the Glass Transition. Multidimensional Spectra, Correlation Functions, and Stochastic Processes. Time-Domain Signals for Multidimensional Spectra. Multidimensional Exchange Spectra: Simulations, Models, Angle Distributions. Determination of Order in Polymers by Multidimensional NMR. Domain Sizes and Internuclear Distances from Spin Diffusion and Dipolar Couplings. Appendices. Chapter References. Index.